How can we move beyond conventional strategy development and conceive of entirely new system experiences that become new marketplaces? What markets and customer needs should we be focusing on? How will these change over time? What specific development opportunities should we target? Which elements should we own versus source? Who should we align with and partner for greater value creation? Are our ideas and concepts economically viable and attractive? How can we emphasize the uniqueness of our value proposition to differentiate ourselves? Once an opportunity is identified and articulated, what business design will bring success? We help clarify & validate business architectures that will build long-term success for our clients. We address the issues of internal core competencies, market opportunities and threats, alliances / relationships required to build out the vision and the underlying economic model of the organization. How can we avoid being displaced in our markets? How will your business manage technological change and market uncertainty to its advantage? This unique process helps executive teams envision and address the opportunities and threats afforded by marketplace trends and forces. 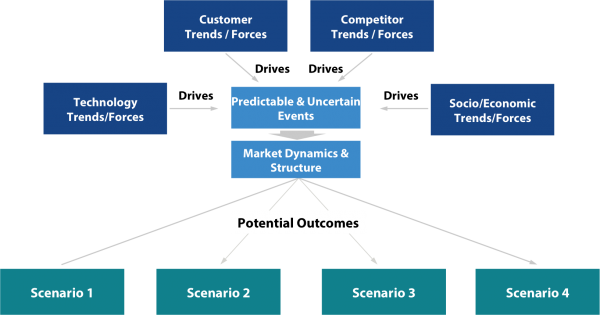 This process helps clients to identify potential future competitive environments and decide upon which opportunities the organization should focus. How can we create a truly differentiated market position? The shift towards Smart Systems is a disruptive change where traditional approaches to market definition and segmentation end and real innovation begins. Understanding needs, usage and buying behavior in a networked context is key to capturing value. It is an attempt to characterize potential customers by the attributes that relate most closely to what they buy, how they participate and use and how they buy and why. How will prosecuting the latest growth opportunity affect my business? What will be my value proposition? What value elements are necessary to prosecute new markets and what creative combinations will disrupt them in our favor? Our methodology coupled with our domain expertise allows us to provide insightful answers to the difficult “what-ifs.” Organizations looking towards a future of connected customers increasingly understand they need new tools and methods to uncover value and growth opportunities in a networked world. Where are your best revenue and profitability targets? We build a customer-centric view of your market by creating a strategic segmentation model that highlights customer groups for whom your offering is and is not differentiated. This allows us to identify attractive customer segments, rank their level of financial and competitive attractiveness, and place them in the order that they should be targeted by your sales and marketing organization. How will we move new innovation to market? The ability to closely couple products and a wider variety of services and partners is a given for Smart Systems. 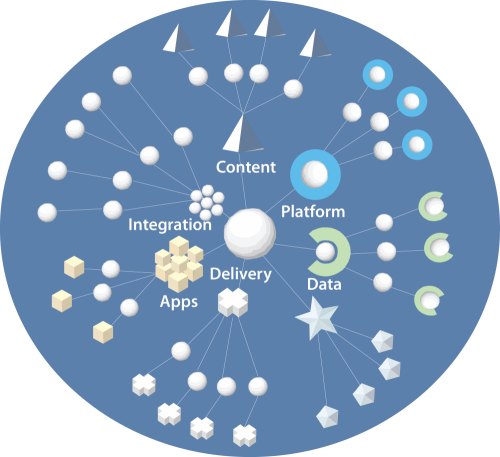 However, trying to coordinate and leverage the respective roles of products and services in a networked context often creates contention, particularly in the channel and go-to-market system. 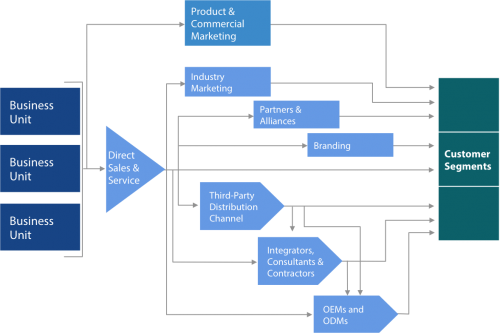 With the on-going turmoil in channels to market due to the emergence of new “connected” business modes we bring clarity across the broad spectrum of channel challenges from direct, to indirect, to partners, to the web. We identify channel and market mix opportunities and help forge a strategy and implementation plan that will drive new customer access, market growth and customer retention. Should we build, buy or partner? The companies that survive and prosper in the era of Smart Systems will be those that embrace the disruption and respond to it with genuinely new thinking about alliances and value-creation in a world of nearly “real-time” information and interactions. Cooperation is a minimum requirement for success. Well-constructed alliances can provide the opportunity to cross-breed capabilities, particularly across disparate markets and geographies. 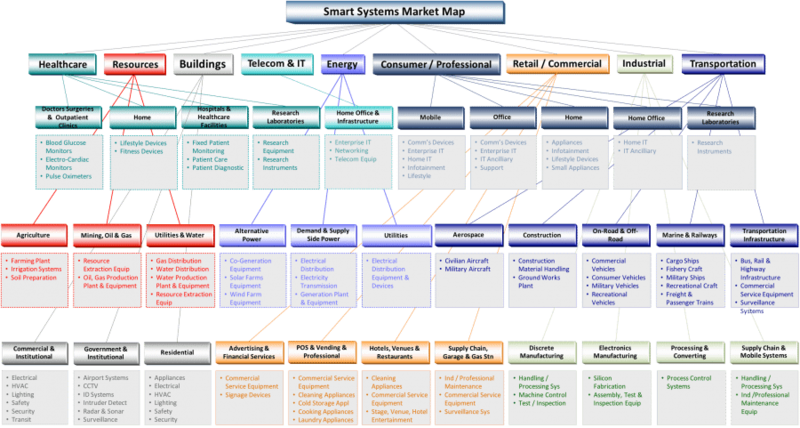 Ecosystem design and development will be the hallmark of many winning Smart Systems solutions. How can we gain senior leadership support and investment? It’s hard to know where the ideas and concepts that fuel new business platform solutions will emerge. Often new growth initiatives are not driven from the top of the organization but come from the grass roots. It is often an “orphaned” phenomenon. Whether or not the initiative grew from a functionally strong area of the business, the fact that it can originate in far flung parts of the business often prevents the program from gaining the upper management visibility or customer driven engagement required to succeed. Companies making radical changes in their business models often face challenges in explaining their new business models to internal management or external investors. Those who see the new world coming and want their companies to win need to be careful in presenting new business plans; simplicity and completeness must be balanced. The case for Smart Systems platforms needs to incorporate much more than simple economics and paybacks — it must envision the full system and market value — tangible as well as intangible values.